The next generation storage engine for Couchbase Server and Couchbase Lite: ForestDB. Now available in Beta! ForestDB project is an open source embeded key/value storage engine with great performance and space efficiency. The project started implementation a year ago. The main objective was to address the main drawbacks of typical B+-Tree index structure and push disk IO performance to the next level. The initial presentation of the new HB+-Trie structure, which is the underlying structure for ForestDB, was originally presented at ACM SIGMOD 2011 by Jung-Sang Ahn. Chiyoung Seo is leading the team implementing ForestDB with Sundar Sridharan at Couchbase. Through the implementation, we have seen a great deal of improvement on SSD (Solid State Drive) performance. Under the hood, ForestDB is an MVCC (multi-version concurrency control) append only storage engine. ForestDB provides snapshotting capabilities to create multiple views of the database and ForestDB supports rollbacks to the snapshots. If you like to learn more, check our our repo. Our goal initially was to shatter key/value storage performance numbers with ForestDB so I’ll give a quick glimpse into that before I close. 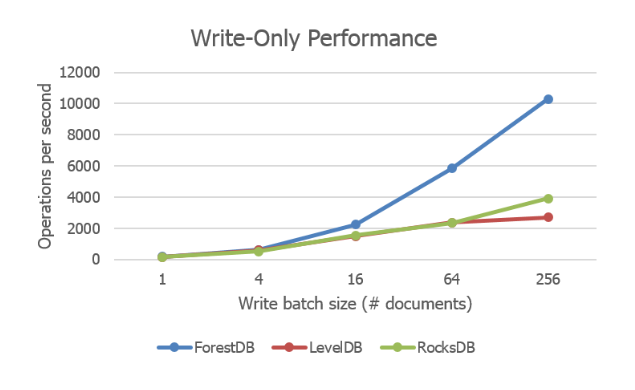 We have compared ForestDB with LevelDB, RocksDB and for mobile deployments to SQLite. I am happy to report we outperform both in mutiple dimensions. I’ll highlight the write performance compared with LevelDB and Rocks DB here given that usually is the most challenging one to scale – you can see over 2x better throughput with the batch of document count below. Benchmarking is always a complex matter so I encourage everyone to explore the full details. Please refer to the performance results page we have published for full details. We are very excited to put ForestDB out in beta before it shows up in Couchbase Server and Couchbase Lite. We welcome contributions and feedback. Please reach out to us thorough the repo. lets continue to innovate in the storage engine tier together. Are the performance test data and the load scripts available for download? Thanks for the inquiry. We have the scripts for performance measurements and comparisons, and will push them into the github repository soon. Support android CBLite now ??? And how to update my old android CBlite project to this ? Hi There, this is in the works. I don\’t have a specific date to share at the moment but will post as soon as we have clarity on timelines. thanks! Hi @alexanderpetrossian:disqus, if you meant forestDB in 3.0, that is happening. We will have forestDB supporting the new global secondary indexes. Cihan, my main concern was in reducing the persistence disk requirements. In 2.x days it was about 10x less in one of our use case. Session storage. We have pretty busy sessions. And we need them pretty much persistent. On jira comments I remember a plan to speed the persistence up by using a new storage format. Please correct me if I misunderstood, Cihan. – Another is to introduce ForestDB for Couchbase Data Service storage. There are small improvements in 4.0 Data Service storage but ForestDB for data service is still in the works. Only Index service will get ForestDB in Couchbase Server 4.0.